Carotenoids are particularly convenient subjects to study by means of Raman spectroscopy due to very high Raman scattering cross-section associated with their chain vibrations. Raman studies of carotenoids in single cells have a variety of applications starting from monitoring of growth and morphogenesis of unicellular algae and ending with differentiation of cancerous versus non-cancerous tissues in humans. 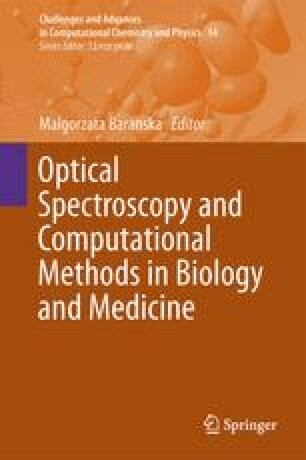 Examples illustrating the potential of Raman spectroscopy to investigate carotenoids structure and distribution with a particular impact on studies using chemometric and computational methods as a tool to analyze experimental data are reviewed in this chapter.